So I set about thinking how I could still keep the spirit of the bread, but lighten things up a little and make it my own. Essentially, I cut down on the rye, halved the seeds (I didn't have hemp so I used sunflower instead) and added a tangzhong. 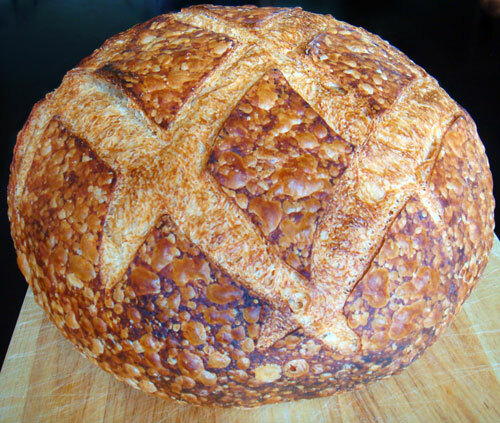 All these elements combined to make a light seed loaf, with a soft, moist crumb but with a firm bite provided by the seeds. It makes excellent sandwiches but really comes into its own when toasted and lightly buttered. The seeds get an even nuttier flavour. I made the preferment, the soaker and the tangzhong in the morning. To make the tangzhong, mix 40g of flour with 200g of water until lump free. Over a low heat bring the mixture up to 65 degrees C whisking all the while. It will start to look like glue. Remove from heat immediately and keep whisking for another minute or two. Allow to cool to room temp and refrigerate until needed. I mixed up the final dough in the afternoon when the rye preferment had peaked. The dough was really sticky at first and I had to knead for about 10 - 12 minutes by hand until it got to the point where it stopped sticking to my hands and the counter. That was somewhere between 600 and 800 slap and folds (Bertinet style). Eventually I even managed to pull a decent windowpane from it. I let it relax for about 20 to 30 minutes and then shaped it and put it in the loaf tin. I was going to bake when it had proofed fully but had to go out for four hours so it got refrigerated and was baked later that evening. I forgot to take it out of the loaf tin half way through the bake and it was only taken out for the final ten minutes. This accounts for the somewhat pale sides as opposed to the nicely browned top. 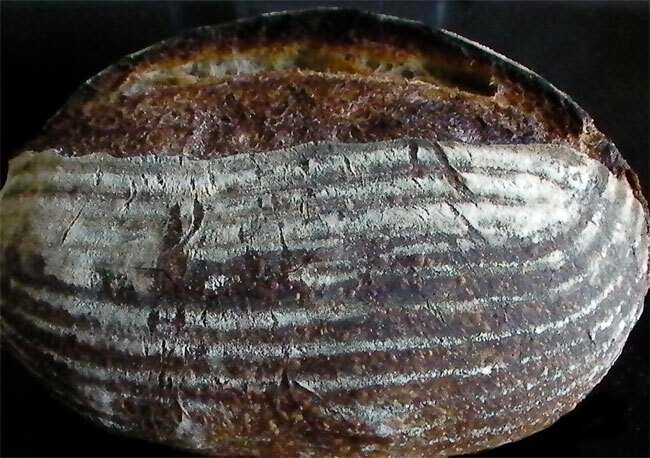 Here's another shot of the loaf from a slightly different angle and the clouds playing funny with the light. Unfortunately I cut the loaf before I considered taking pictures of it so I don't have any of the uncut loaf. Allow to peak. Once it has peaked and started to recede, it will get more and more acidic. I wanted a young levain for this loaf so I used it when it reached its highest point. This took somewhere between four and five hours in my 28 degrees C kitchen. It had a nice fruity aroma and wasn't at all sour. 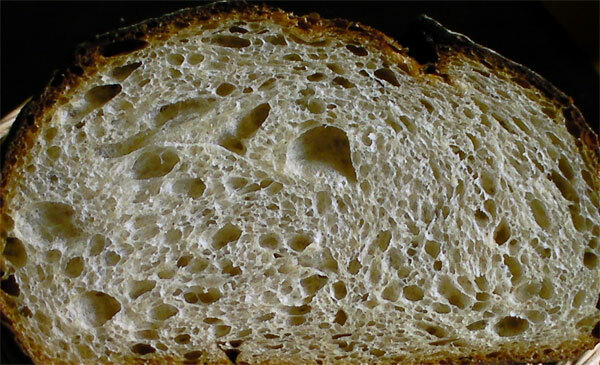 Disperse the levain in the water with a wire whisk. I like to whisk it up until it has a good foam on top. Next, whisk in rye and malt powder. Then add bread flour with spatula and mix until all the flour has been moistened. 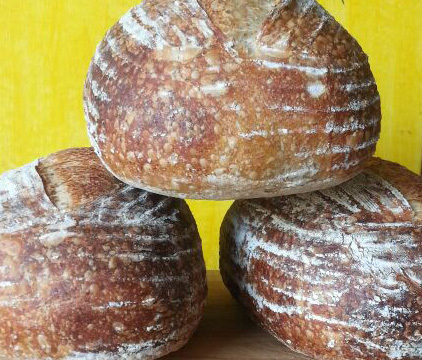 The proportionately large amount of levain in this recipe means that the dough develops really quickly hence the relatively short bulk fermentation time. For the first two attempts I used smaller amounts of starter (30 and 20g respectively) and let the levain ripen for 12 hours. As Josh suggested, this made for a more sour levain. So more starter and a shorter ripening time is what he recommended. It worked really well and I am really pleased with the way this turned out. I like adding all my whole wheat to the levain as I feel it gives it more 'wheaty' flavour. On the other hand, I don't like adding too much rye to the levain as it gets too sour too quickly. The flavour of this bread improves with time and by day two (yesterday) it had a slight tang. I received a copy of Tartine for Christmas last year and have been making the basic country loaf regularly since then. The quantity of dough the recipe makes is perfect for my three 25cm oblong bannetons. I scale the dough to 650 grams a piece and retard in the refrigerator for up to 18 hours. The above loaves were only retarded for 12 hours. I pretty much do everything as per the recipe except that I add all the water at once. In other words, I don't hold back 50g to add after the resting period. It saves an extra step and prevents very messy hands from trying to squeeze the water into the dough. My other variation is that I do knead. I don't have a stand mixer so I knead by hand. About 400 slap and folds or until the dough is moderately developed. I like to think this gives the loaves better volume and height but I have never done a side by side test so I can't be sure. Anyway I like kneading dough and it is a difficult habit to break. I bake at 230C on a baking stone with steam for 15 mins (no convection) and then for a 25 mins without steam with the convection on. I'm not sure how this relates to the baking instructions in the book but this is what works for me and my oven. I know in the book they use a Dutch oven or a combo cooker but I am not certain of the baking times. 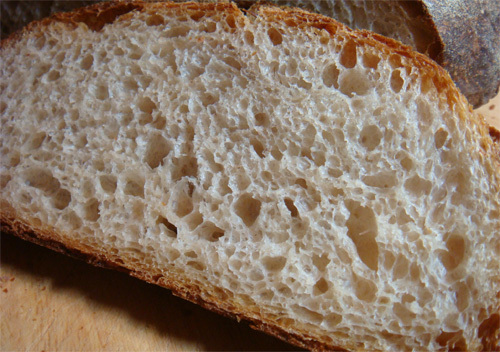 A cross section of the crumb. And finally, my favourite use for this loaf: grilled cheese! This one is just a basic cheese and tomato. The tomatoes are vine ripened organic and beautifully sweet! 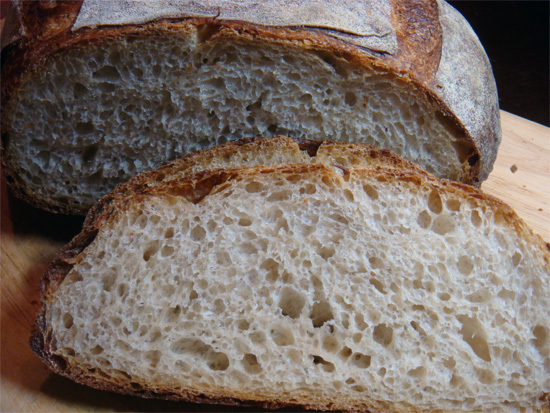 I made this loaf using Josh's process which he outlined in my previous blog post on San Francisco style sourdough. (You will need to scroll down to about the halfway mark to view the post). Allow to mature for 12 hours. 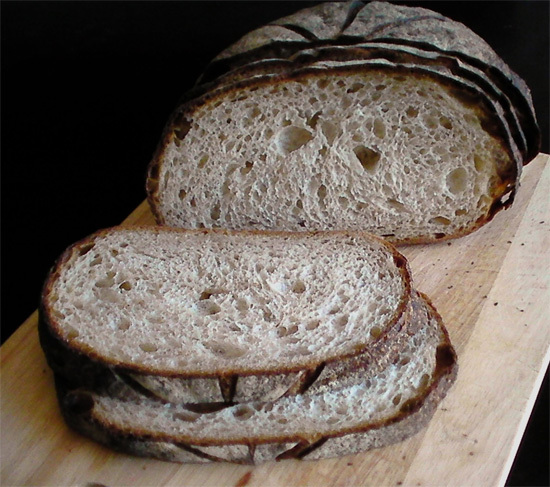 * Josh uses 60% levain in the build, 100% water and 100% flour of which 5% is rye. I can't use 60% starter in my levain build as it would ripen in three hours with our temperatures over here. If you plan on following this recipe, you would need to adjust the amount of starter in the levain build so that it matures in 12 hours. 20% starter works out perfectly for me at temperatures of 27C. Refrigerate the dough immediately. Josh divides into pieces that aren't super thick and retards in lightly greased tubs. He retards at 40F. Remove dough and allow to come back to room temperature (one to two hours). Now shape and Josh advises to proof for 3 -5 hours but once again that was not possible for me to do because it would have been overproofed with our warm temperatures over here. I let it proof for 1 and a half hours. It was just starting to show signs of activity. Retard for another 20 hours. I retarded for a full 24 just because I only got home late Sunday afternoon. don't forget to bake it dark. Deep red and a hint of black. Yum. This made for some of the tastiest all-white sourdough I have ever eaten. It really was worth the wait and despite taking almost 3 days to make it was quite effortless. There wasn't much to do except wait. Fortunately I have been extremely busy lately and had no time to camp outside the refrigerator waiting anxiously. The crust is very chewy on the day after the bake. 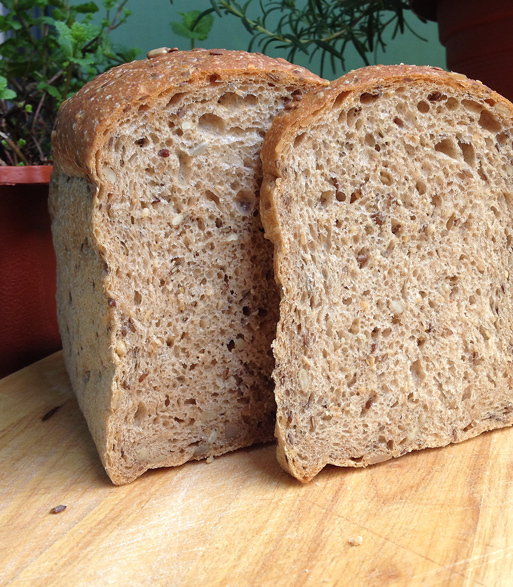 It had the kind of flavour in it that I would normally only associate with a loaf that had some whole grain in it. 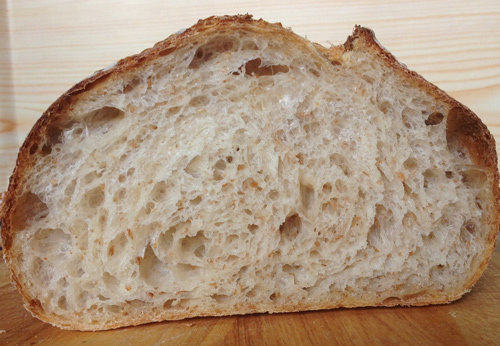 The crumb was light but consistent with the 11.4% protein flour that I used. My only quibble is that it only had the tiniest hint of sour. I don't think this is a problem with the recipe, but rather with my flour. I know if I used this process with only 15% wholegrain, I would get a very pronounced sour flavour. 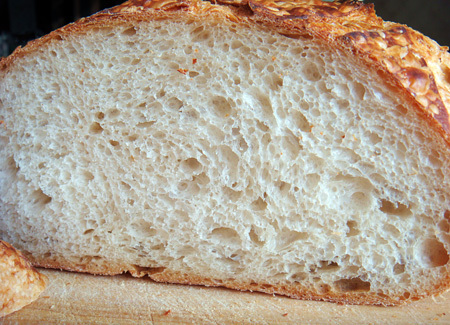 It just seems very difficult for me to get a really sour all-white loaf with the flour I use. I know all flours are not created equally and could it be that my flour is lacking in something that will let it get really sour? 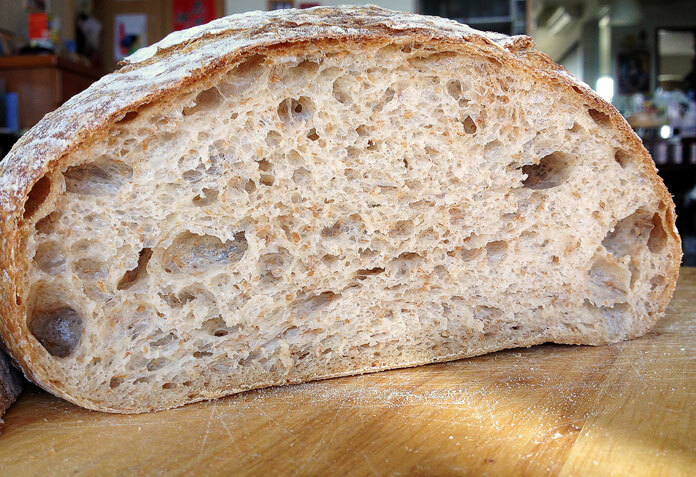 The only time I have got a really sour all-white sourdough with this flour was when I added sugar eggs and butter. I could smell the sour while it was baking in the oven. Recently, I have been experimenting with adding maltose at a rate of 5% and getting very good results with that, too. Not as sharp a sour as I got with sucrose but a very mellow sour which lingers in the mouth long after it has been swallowed. Ferment @ 29C (84F) for 9 hrs. Allow to sponge @ 28C (82F) for 3 hours. Knead until gluten moderately to well developed. 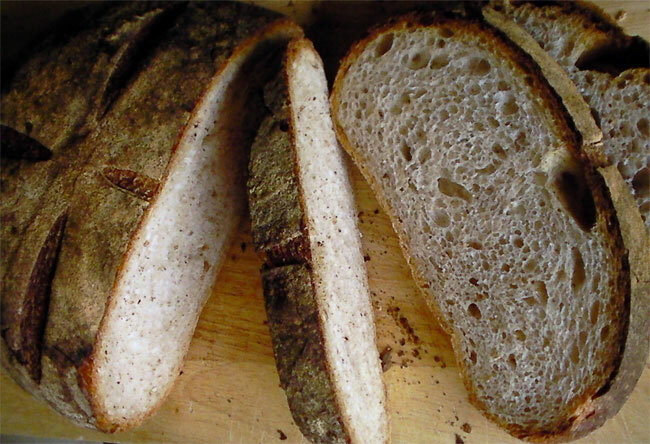 You need to have the gluten fairly well developed because the bulk ferment is very short. One hour bulk with folds at 20 and 40 mins respectively. Pre-shape. Rest 5. Shape. Place in cloth-lined banneton. Three-quarter proof. (About 1.5 hours). Retard in fridge for 7 - 9 hours. Remove from fridge and allow to final proof (about 1 hour). Pre-heat oven to 230C (450F). Slash. Load onto baking stone. Immediately reduce heat to 205C (400F), convection off. Bake for 20 mins with steam. 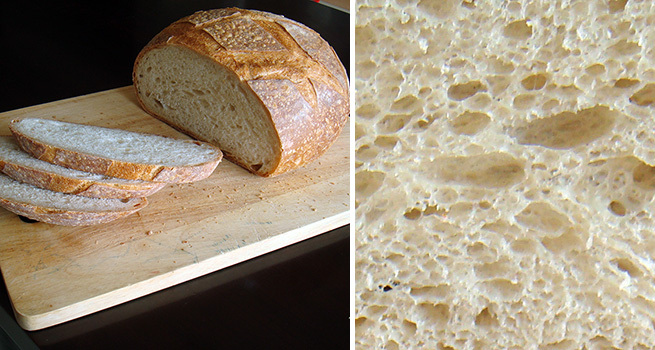 Remove steaming appartatus when the top of the bread starts to show signs of colour. Reduce heat to 190C (375F), convection on. Bake a further 25- 30 mins. (You might have to experiment with baking temps/times. 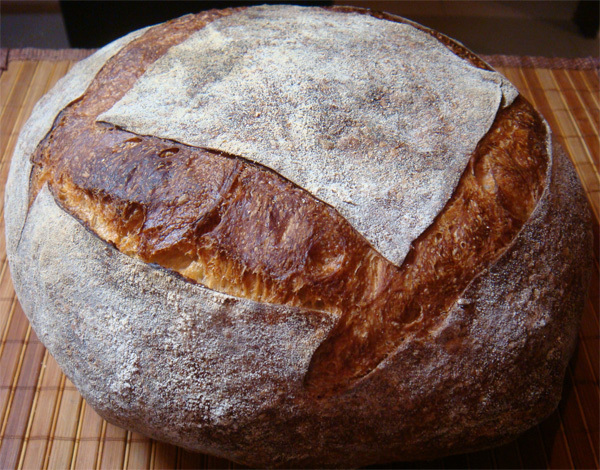 I baked this at a lower temp than I usually do for my regular sourdoughs. 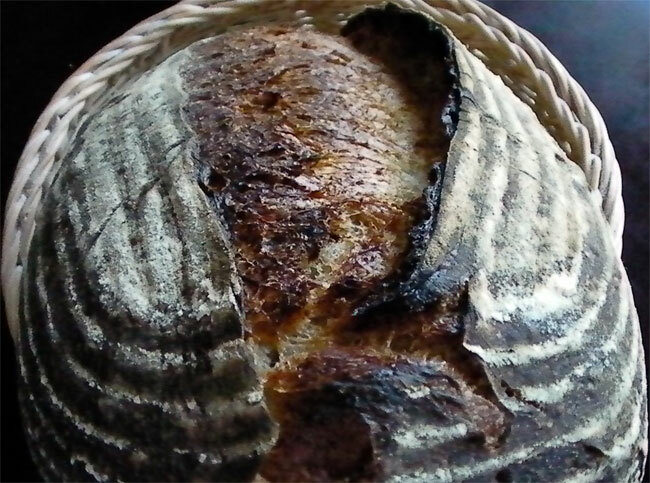 You don't want to have a deeply caramelized crust like for that of a miche, but rather a reddish-brown crust with nice blistering). It has a distinct but, what I would categorize as, mild sour flavour. This was my third attempt at this recipe and was the least sour of the three. This could be, in part, due to the fact that the weather was slightly cooler and the temperatures were slightly lower than the temperatures when I first formulated this recipe. It could also be due to the fact that I changed the composition of flours. 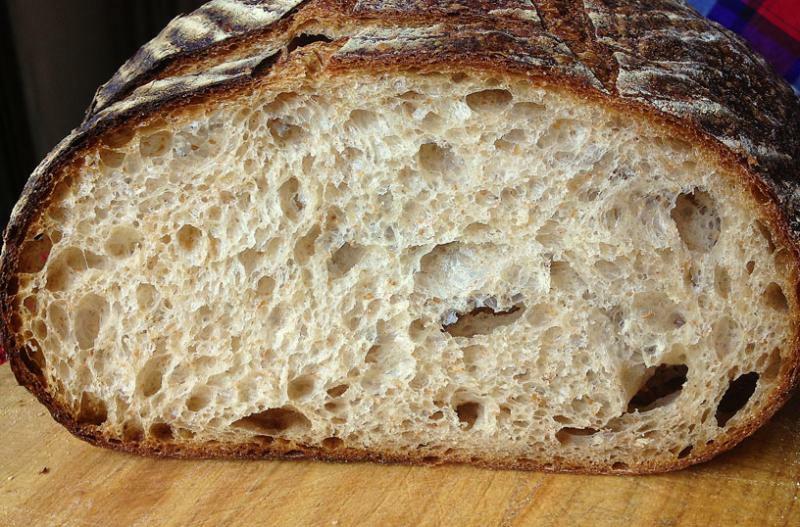 Despite the open looking nature of the crumb shot, it was actually quite firm to the bite. This is undoubtedly the result of the high protein flour. The crust was chewy, too. On my first attempt I used 11.4% protein flour for both the sponge and the main dough. I also gave it a 50 min autolyse and added 3g of diastatic malt. The main dough was very sour tasting and got sticky quickly. I attribute this to too much enzymatic activity and the enzymes breaking down the gluten. The resultant loaf had a rather low profile and a moderate to strong sour flavour. On my second attempt I considered using the same flour but lowering the hydration to counter some of the stickiness. Instead, I kept the hydration the same and used a higher protein flour for the main dough. The result was similar to the first attempt although the main dough wasn't as sticky. The profile was still rather low, though. For this try, I ditched the diastatic malt, reduced the autolyse to 20 mins and used a 12.4% protein level flour for both the sponge and the main dough. This resulted in the best profile but the mildest flavour of the three. I want to work on this one a little more. For my next attempt I want to keep everything the same but let it proof for only an hour in the bannetton, then give it double the time (about 16 hours) in the fridge. 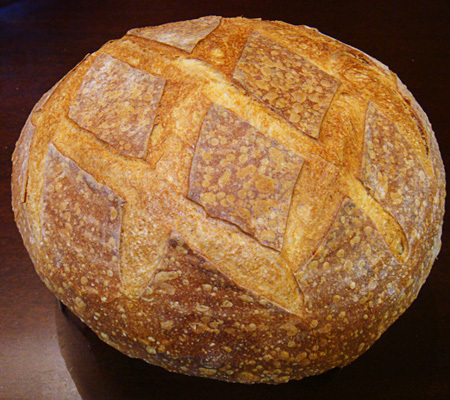 I am hoping this will get me where I want to be: a moderately sour, chewy loaf with a reddish-brown, blistered crust. Here is a boule I made last weekend that is worth sharing. I had replenished my starter but didn't have enough bread flour on hand to make up my usual dough. I knew if I made a trip to the store, by the time I came back, my starter would be past its peak, so I just made up the difference with the flours I had on hand. Whisk up starter, water and diastatic malt. Add remaining flours in increments and mix until all the flour is hydrated. Add salt and knead until medium gluten development. I don't have a mixer, so I always knead by hand. It takes about 8 to 10 minutes of quite vigorous slapping and folding. Pre-shape, rest 20 mins, shape. Allow to rise to about three quarters of its final volume, then retard in the fridge overnight or for about 8 - 12 hours. Bake, with steam, at 230C for 10 mins, turn oven down to 200 - 210C and bake for another 40 mins. Keep and eye on it to see that it is not over browning and turn oven down, if necessary. This recipe is from The Bread Book by Linda Collister and Anthony Blake and it was the second serious bread book I bought about 17 years ago. It was quite forward thinking for its time as all the recipes include weight measurements (metric and imperial). It is still one of my favourite bread books and it is definitely worth a buy. It has really good photographs. Ferment in a bowl at room temp for 3 days. Keep bowl covered with a damp tea towel. After 3 days, it should be smelly, grey and slightly bubbly. Beat (using hand) together with starter until well incorporated. Once again cover with damp tea towel and allow to ferment at room temp for 24 - 36 hours. (In practice, for me at any rate, this step only takes about 5 or 6 hours). I let it sponge until it peaks, then I make the final dough. Don't let the sponge collapse. The bread will be dense if you do. * I find this amount of salt to be too much. It works out to be about 2.5%. I prefer using 2% so I use 13 or 14g. Mix water with sponge, Add salt. Beat well. Add enough of remaining flour to make a soft dough. Bulk ferment until almost doubled in size. *Cut off 170 - 230g piece of dough to make the next starter. Pre-shape. Rest 15 mins. Shape. Place in cloth lined banetton. Allow to final proof. Preheat oven to 220C (425F). Score. Bake (with steam) for 20 mins. Lower oven temp. to 190C (375F) and bake for another 35 - 55 mins longer. I have always found 35 mins to be sufficient. * Because this dough was removed after the salt was added, you now have salt in your starter. It has its advantages. It keeps for a long time in the fridge and slows down enzyme activity. This was the only way I made sourdough until the arrival of the internet and my discovery that there were other ways of making it! Remember the second time round your starter will have salt in it, so you need to subtract that from the total amount or just add 2% of flour added. This makes a really good sourdough with a very mild (unless you retard) tang, but an excellent flavour. I have been going through a bit of a baking drought lately, but on Friday lunch refreshed my starter so that I could bake when I got off work in the evening. I hadn't planned on anything, but when I got home and found the starter at its peak, I had to act quickly and there was no time for elaborate planning. Accordingly, I just ad libbed and this is what I did. * I used less starter than usual. Normally, I would use 150g of starter for this amount of flour, but because it is just so hot over here now, I was worried that it would be too much. It turned out to be the right amount. Whisk up the starter, water and malt until frothy. Add the rye, semolina, whole wheat and bread flour in increments and ensure all the flour gets wet. Autolyse for 50 mins. Add salt. 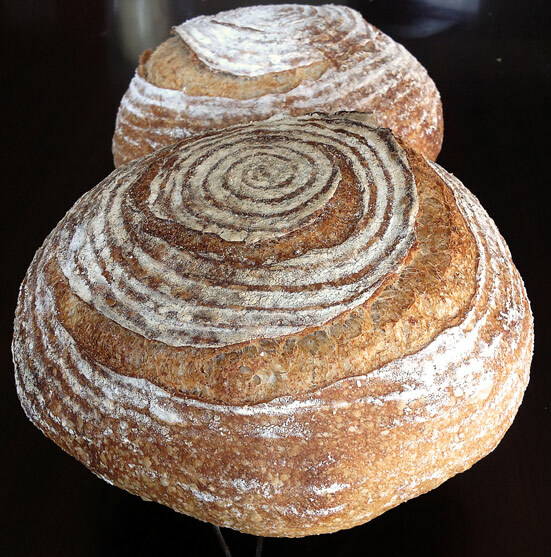 Knead to medium gluten development. Bulk ferment. This dough developed fast. This is in part due to the whole grain and diastatic malt and in part due to our very high summer temps. It was ready for final shaping in an hour and a half. Pre-shape, rest 15 - 20 mins, final shape, place in banneton and retard overnight. Baked at 230C, with steam for 20 mins and without at 200C (convection on) for another 25 mins. Crack open oven door, turn oven off and allow bread to rest on baking stone for another five minutes. 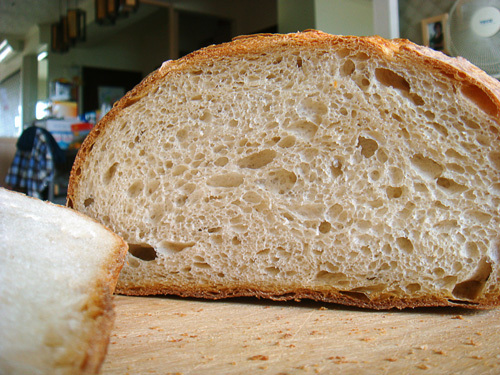 It has a moderately open crumb. The large holes were unintended. I really like the flavour of this bread. It has a mild tang and it improves in flavour with time. Yesterday it tasted great with some good cheese ( a nice mature cheddar) and nothing else, not even butter.